I have been pining for this book for a LONG time, seriously, I added it in June 2010 to my TBR list! 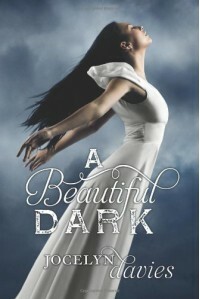 And the cover is just gorgeous! So I was really excited to finally get to it! And this book didn't disappoint. I have read several angel books in the last year and some of them I LOVED and then there were those who just weren't for me. I thought this book had a really intersting take on angel lore and I loved how non-preachy it was, which is one of my main problems with this subgenre. I really liked Skye, she was just a regular girl (or at least she thought she was), with real friends and a caring parental figure, her mom's best friend who took her in after her parents died. Though she is frequently absent, and that is one of my bookish pet peeves, in this case there turned out to be a very good explanation for this, so props to the author for that! So, at first everything was a bit confusing with Devin and Asher and their secretiveness, but that you didn't know if these boys meant well or not and what their real agenda was made it all the more a pageturner! I flew through this book, it was so good! And the boys, let's talk about the boys. While I'm one of those who don't really like love triangles, in this one it worked, but I'm not gonna tell you why, because that would spoil things. BUT, let me just say that while each boy had his charms, I am partial to Devin. I think it's the calm and the troubledness he exudes. And yes, for those of you who read it: even after the ending. I know, I have a serious Devin crush. But OMG, the ending! Can you say cliffhanger? Seriously! I need the next book right now! I'm also dying to know how this whole thing will play out besides the ending, because I think there's a lot we still don't know about Skye and what it is she can do and well, ALL OF IT!